Excellent. 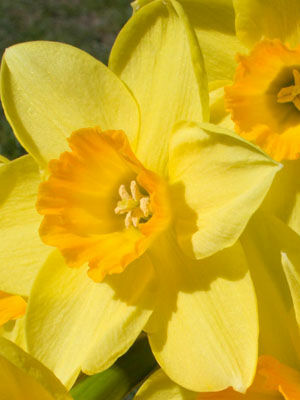 Most daffodils are hardy to -25F (-32C); cold tolerance varies with species. Allium. The earliest daffodils bloom before most other flowers and shrubs. Planting daffodils behind daylilies or other summer-blooming perennials hides the fading daffodil foliage from view. Set out dormant bulbs from late summer to early winter. Cover the bulbs to four times their depth with loose soil. Allow 4in (10cm) between bulbs of miniature daffodils, and 6in (15cm) between taller varieties. Daffodils are the best spring-flowering bulbs to grow as perennials. Yellow and white are the most common flower colors. Cut daffodils to use as cut flowers when the buds are full and almost ready to open. They will continue to open indoors for several days. As the flowers fade in the garden, trim them off with scissors or pruning shears. Daffodils have few pest problems and are seldom eaten by deer. Large, double-flowered varieties are prone to falling over when the blossoms get heavy with rain.